Remediation is a significant component of the Atlanta BeltLine, one of the nation's largest and most wide-ranging urban redevelopment and mobility projects currently underway, Approximately 1,100 acres of brownfields are in the process of being transformed into 22 miles of transit, 33 miles of multi-use paths, and 1,300 acres of parks and greenspace in a loop around the city. 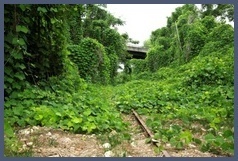 Challenges common to former railroad and industrial sites involve widespread and varied levels of contamination, including toxins that were used as herbicides to control vegetation. 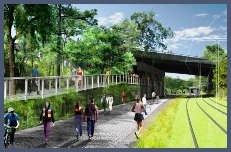 After acquiring the property for the 2.25-mile Atlanta BeltLine Eastside Trail in 2007, an EPA revolving loan fund provided $815,000 for remediation of the site before construction commenced. EPA, Georgia Environmental Protection Division, City of Atlanta, Atlanta BeltLine, Inc. and AMEC implemented an innovative solution to removing areas of contamination and otherwise remediating the property in accordance with state requirements. In all, approximately 1,700 tons of contaminated soil was removed. This process is now serving as a model for the rest of the 22-mile corridor. Atlanta is reaping the benefits. For the BeltLine project, there have been 127 cleanup jobs leveraged and 4,500 redevelopment jobs leveraged. In addition, leveraged funding has exceeded $750,000,000. 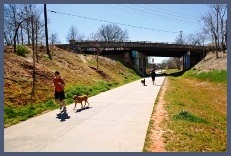 Get the full history and up-to-date progress of the Atlanta BeltLine with a three-hour bus tour of the full 22-mile loop during the Brownfields 2013 Conference in Atlanta. You can also see how the Atlanta BeltLine Eastside Trail is revolutionizing development with a walking tour of Ponce City Market abutting the multi-use path. And in the near future .. The National Brownfields Conference, co-sponsored by the U.S. Environmental Protection Agency (EPA) and the International City/County Management Association (ICMA), is the largest training and networking event in the nation focusing on environmental revitalization and economic redevelopment. The conference is designed to bring together stakeholders in government, business, nonprofits, and academia who promote positive change in their community. Now in its 15th year, the event attracts over 5,000 attendees and 200 exhibitors for two and a half days of educational sessions, training workshops, volunteer activities, mobile workshops, film screenings and much more. This is the place to be where all topics related to brownfield cleanup, ranging from community engagement to public health, will take center stage in Atlanta's renowned Georgia World Congress Center on May 15-17, 2013. In-person ACRES training will be available at the National Brownfields Conference on May 16 and 17. Beginners ACRES training will be held on May 16 at 11:00 am - 12:15 pm and 2:30 - 3:45 pm. Advanced ACRES training will be held on May 16 at 1:00 - 2:15 pm and May 17 at 9:45 - 11:00 am. Also, if you are interested in learning how ACRES interacts with the Brownfields Inventory Tool (BIT), please attend the educational session on May 17 at 1:00 - 2:15 pm. Please visit http://www.brownfieldsconference.org/en/home for more information on these and other exciting educational training sessions! Response for problem resolution will be faster. There is now only one Help Desk to contact for issues. Updated! All QRGs and videos have been updated on the ACRES Information Page (http://www2.epa.gov/brownfields/brownfields-grantee-reporting-acresindex.htm) to reflect the new log in information and all changes made to ACRES since October 2011. There are also several new guides/videos including one for work package sharing and another for resetting your password (in case you forget yours or it's time to reset the password (EPA requires this every 90 days)). "Cancelled Grants" has also been added as a filter option on the "Find Property/Cooperative Agreement" tab. The new option can be found in the Cooperative Agreement Status filter section (added to options: Open, Closed and All). If a work package I returned for clarification has been in the same status for more than ___ days. The listing of CAs is now displayed in order by award date so that the most recent CAs will appear at the top of the list. The order used to be random. This will make it easier to access the records used most frequently. Registration for the conference and training will remain open until 5:00 pm ET April 24, 2013. After this time, you will need to register on-site as an attendee at the GWCC beginning at 8:00 am on Wednesday, May 15, 2013. Progress towards meeting the FY 2013 program goals is impressive already, especially in Jobs Leveraged and Properties w/Assessments Completed. And we're only half way through the year! Sometimes our cooperative agreement recipients (CARs) have questions about how to add new projects and cooperative agreements (CAs) to their ACRES accounts. It is important to make sure that all of your CAs are associated to your account so you are able to keep track of all of your projects. This article will focus on these issues as well as some new system enhancements designed to help you keep track of your CAs more easily. The first thing I always go over with CARs is to make sure they have all of their CAs associated to their account, even older CAs that may have already been closed out. When you log in to ACRES and click on the "My Cooperative Agreements" tab, you should see all of your CAs listed. In the newest release of ACRES, we have made an enhancement to list your CAs in order by Announcement Year so your newest CAs will always be listed at the top of your page. For recipients who have received numerous CAs over the years, this new sort order should make it easier to find a specific CA. In the next release, you will notice that your CAs are displayed in tabular format with clickable column headers. By clicking on the column headers, you can sort your CAs by CA title or number, award year, state, CA type or funding type. This will make it even easier to find a specific CA. Once you have ensured that all of your CAs are associated to your account, then I recommend you check out all of your Brownfields properties and projects under the "All My Projects" tab. When you go to the "All My Projects" view, please note that you can sort all of your projects by property name or ACRES property ID to help you keep organized and find a specific project more easily. To update any of your projects, just click on the "Enter Data" link in the fourth column to access the data entry screen for Property Profile data. If you have projects that are not currently listed here, it is probably time to associate additional properties to your CAs. To do this, access your "My Cooperative Agreements" tab, select the correct CA by clicking on its link, and look for the gray "Add Property to this Cooperative Agreement" button in the Properties Addressed By This Cooperative Agreement section. Remember, when associating property records to CAs, it is very important to first check for an existing property record for your site before creating a new (and potentially duplicate) property record. See the January 2012 ACRES Bulletin for a much more detailed discussion on adding properties to CAs.